I’m going to start this review by stating that I’ve never read the Sandman graphic novels. I know … I know … don’t hate me for it! Why do I want to state that I haven’t read Sandman? Because the very first words at the top of the cover of this book are: From the pages of The Sandman. I have no way of knowing how this book, or these characters fit within the Sandman stories or universe. I chose to read this book because it sounded like the blending of two interesting genres: mysteries, and supernatural/horror. It is the blending of two genres. But it isn’t interesting. First…it doesn’t appear to be one story, but a few stories. The unifying theme is the two boys, who are dead, deciding to be detectives for the afterlife (well, maybe not just the afterlife). 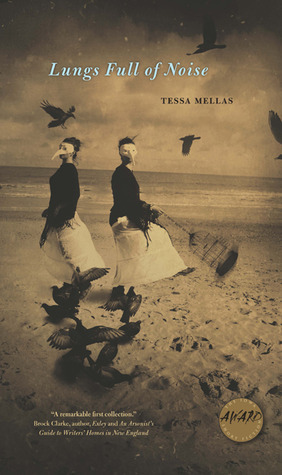 In the first story, they go in search of a dead cat, for two dead girls. Um…yup…that’s pretty much the extent of it! Then the boys visit the school where they were brutally murdered. The school is still host to bullies, only know the bullies are also dead and still picking on kids like our two detectives. There’s a teacher who is a terror who the boys manage to evade, and there’s a non-dead girl investigating ghosts who visits the boys’ school. I read this book twice because I just couldn’t follow what was going on. The second reading didn’t help much. I’m not sure when I realized that the boys were dead (I think they say something about it, but it’s a few pages in. So, too, with the girls looking for their cat. There’s a strange lack of division between the dead and the living throughout, and you have to wait to be told who’s dead and who’s alive and, well, that just doesn’t work too well. The story(ies) jump around a bit and because we don’t really know anything about these characters, it just doesn’t make a lot of sense. This has me wondering if the characters are better outlined in the Sandman comics and it is presumed that readers here will know who these people are. If so…presumption wrong. I wanted to like this. It seemed to have a lot going for it. I even gave it a second shot. But I still didn’t really care for the characters or the story line. The art is decent; at times really nice and at times rather average. But I wouldn’t buy this just for the art. I might choose to thumb through the next volume to get a sense of whether or not the story has picked up, but I’m not holding out a lot of hope. Looking for a good book? 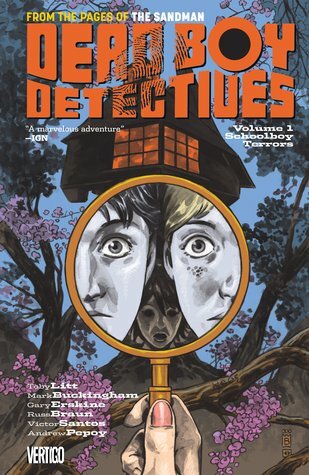 Dead Boy Detectives tries to blend mystery and the supernatural, but simply gets confusion. IDW Publishing, under the hand of artist Darwyn Cooke, has begun to adapt the “Parker” crime novels of Richard Stark, into graphic novels. 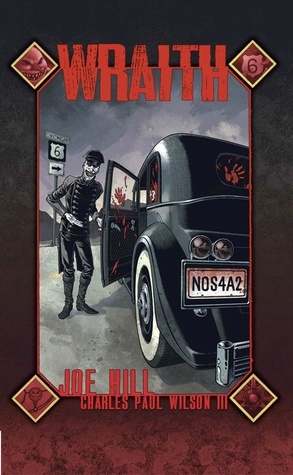 In conjunction with this, they are also releasing reissued, hardcover versions of the books, lavishly illustrated with Cooke’s cover paintings. This is an all-around resounding success! Parker: The Hunter is the first book in the re-issue series and it is a classic, gripping tale of macho men working in a dirty business with untrustworthy associates. And Parker is the macho-ist of the men. Betrayed by a colleague, and someone who works for a major crime syndicate, Parker is left for dead, shot by his own wife. 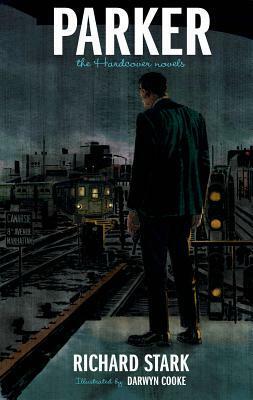 But tough men are hard to kill and after recovering, Parker storms New York and exacts his revenge on his wife, his partner, and the syndicate that employed the partner. Stark’s writing is tight and direct and captures the gritty underbelly of the crime world. It is violent and rough, yet Stark manages to not glorify the violence while giving us a main character that we can root for. He does this by giving Parker motive, even if it’s the very basic desire for vengeance and revenge. Stark also manages to sneak in just a little humanity to the powerful ‘machine’ of Parker by having him question, albeit briefly, his lack of remorse over the amount of killing he’s suddenly doing. This is pulp crime fiction at its best and for those of us who are being introduced to Parker for the first time, we’re in for a treat. And for those who remember the stories will enjoy the new editions with the great artwork by Darwyn Cooke. Cooke’s paintings are perfect for the novels. They capture the era and look as though they could have been painted in the early sixties. From the tacky hotel wall-paper to the style of clothes, Cooke has clearly done his research for these paintings. My only complaint…there aren’t enough of them! This reissue has done exactly what the publisher would hope it do…it has captured my interest so that I want to read each successive reissue, and the art is so wonderful that I also want to make sure I read the graphic novels as well. This is a resounding success. Looking for a good book? Good, old-fashioned crime/pulp fiction told by the master story-teller Donald E. Westlake, under his pseudonym Richard Stark, with beautiful paintings by Darwyn Cooke, can only mean that this is a book you won’t want to miss. If I could read only one graphic novel series, I think that Fables would be my choice. The characters are familiar and yet newly imagined, made relevant to readers today and interact with one another in completely new ways. If you haven’t read any of the Fables series you really need to go back and experience this journey from the beginning. Though I’ll admit that I’ve missed a number of issues in the middle and feel I’ve managed to catch up quite rapidly. Many of the different storylines seem to be converging (perhaps because the series is coming to an end?) and each of them is intriguing and remarkable. 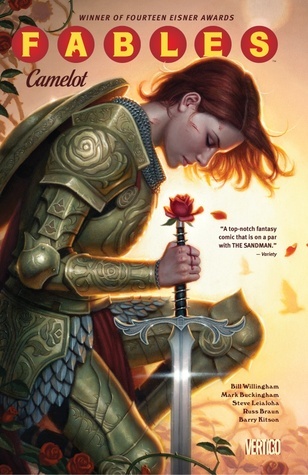 Rose Red is re-creating Camelot, Brandish isn’t quite dead, Bigsby Wolf is visited in in the afterlife by two friends (possibly my favorite sequence in this book), Rose Red and Snow White squabble like sisters, and Bigsby’s remains go missing. There is so much here, and it’s tremendously fun. The artwork is a perfect complement to the story. I particularly like the side panels throughout, which reflect the theme, mood, and location of the action panels. This is a really wonderful series, one that will be missed by many, but hopefully it means that Willingham has other ideas that he wants to invest his time in to, and whatever it is, readers should take note. He clearly knows how to tell a story. Looking for a good book? Fables should be on your reading list. Fables, Vol. 20: Camelot is a strong addition to an ongoing storyline, with great storytelling and beautiful art. What happens when a man loses his wife in an accident and he can feel his children slipping away and everything good he once thought about the past turns out to be a lie? He goes to a music festival, of course! Gary Cochrane is a single parent of two teenagers. The kids are trying to get out from under their father’s control and become adults, while Gary struggles between losing control of his kids and finding a way to hang on to his youth. It’s a fairly typical struggle and anyone who has teenagers, or who was a teenager, will understand and empathize with the struggles. The backdrop of the world’s largest open air music festival is wonderful and I love the dual meaning of the title as Cochrane is facing not only the music of the festival, but forced to face the music of change in his life. But while the idea of the story and the location are well met, the character of Gary Cochrane is depressing, destructive, and I never understood why I should care about his story. Numerous times while reading I simply got frustrated with his actions and controlling and I simply wanted to slap him around a bit. But it wasn’t just that he was controlling about his children’s lives…it’s that he didn’t seem to understand when to let go and when to let go and when to have the stronger hand. It’s as if author Tim Thorogood purposely had him doing the opposite in each instance, just to make sure we, the readers, understood that Cochrane was struggling to be a good parent. Cochrane explores the festival on his own, and does a pretty poor job of it, immediately getting himself involved with excessive alcohol and drugs. I think this is the part where he is re-experiencing his youth. And of course we can see where his kids are headed! Cochrane does manage to redeem himself in the end and learns to let go of the reigns just a little bit, even when faced with adult peer pressure (a little overly played, in my opinion), but by this point we’ve already stopped caring about him. We can have hope for the kids, but it’s not really their story. This one just didn’t work for me. Looking for a good book? 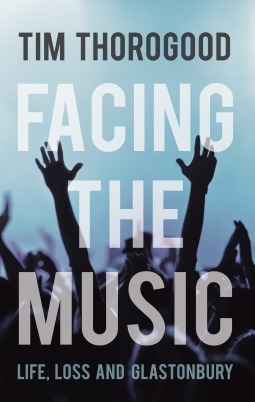 Fans of the Glastonbury Music Festival may welcome the setting and enjoy reminiscing in Facing the Music, but the story of the single parent struggling with parenthood of two teens is dark and difficult to enjoy. Hurley creates a world that manages to be utterly foreign and unusual and yet the reader is able to identify with it. A difficult task. This is a decent summation, and yet it doesn’t fully cover the expansive work. What this doesn’t explain is that forces from a mirror world are in the mix. One of the aspects that I liked the most is the way Hurley treats gender. This isn’t simply a case where females take on what has traditionally been a ‘male role’ in fantasy, but the whole treatment of gender takes on a completely new outlook. I have to admit to one thing, however. I have to admit that I have a very particular reading disorder. I recognize that not everyone has it, but I don’t think I’m the only one. The disorder? I struggle with proper names that have an unfamiliar appearance, and especially names which resemble one another. It is only recently that I’ve been able to read an enjoy Tolkien (because of a great deal of research I’ve spent on Nordic mythology). Other fantasy books are similarly difficult for me, as is some of the great Russian literature, for the same reason. That’s a lot of names/titles and they all look very similar to me (that’s my reading disorder). I’ve seen where others talk about the ‘breakneck’ speed of the book, whereas this book took me weeks to read (this from someone who has been reading/reviewing six books a week!) because I constantly had to check and double-check who the characters were. As I say, I have this problem with any fantasy with multiple main-focus characters with unusual/made-up names. Even with my issue of the names aside, this is not light reading. The book is a bit dark in nature and the reader will have to work a little here, and that’s okay, there is a pay-off, and that is that we have a remarkable saga that will be much talked about in the fantasy literary circles. I will look forward to the next book in the epic, and this time I will know to prepare a cheat sheet of characters (though I wouldn’t mind of the publisher included a list of dramatis personae[I remember when the Niven/Pournelle epics included such a list]). Looking for a good book? 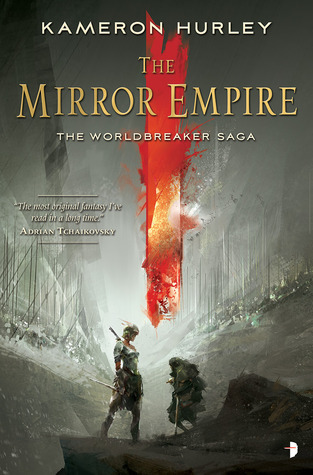 Kameron Hurley’s The Mirror Empire is the beginning of an epic fantasy that readers of the genre will definitely want to include on their reading list (but keep a scorecard of the characters)!